The shifters are known for their connection to the blood of beasts. A savage animal lurks beneath the face of every shifter. Most shifters live their lives dealing with this bestial nature, suppressing the animal urges and killer instinct. Some embrace it, losing themselves to savage fury. Others seek the root of it, training to unlock their animal heritage and claim the power of their ancestors. Still others choose a new route. Utilizing shaper artifacts, intense training, and agonizing magical treatments, these shifters purify their forms, transforming themselves into living weapons. These devoted warriors sacrifice their bodies to the service of the shifter nation forevermore, becoming living engines of destruction for their people. Becoming a warform initiate requires a long, agonizing series of magical treatments and a strict regimen of physical training that most would deem insane or impossible. The entire process takes months of hard effort and pain. New initiates are selected from the elite of shifter troops and trained by senior initiates. Feats: At least two shifter feats, one of which must come from the following list: Beasthide Elite, Cliffwalk Elite, Dreamsight Elite, Gorebrute Elite, Longstride Elite, Longtooth Elite, Razorclaw Elite, Swiftwing Elite, Truedive Elite, Wildhunt Elite. Climb (Str), Craft (Int), Handle Animal (Cha), Hide (Dex) Intimidate (Cha), Jump (Str), Knowledge (nature), Listen (Wis), Move Silently (Dex), Spot (Wis), Survival (Wis), and Swim (Str). Weapon Proficiencies: A warform initiate is proficient with all simple and martial weapons, and with light armor, but does not gain any proficiency with shields. Initiate‘s Mark: A warform initiate who survives the treatments required to enter the order is marked permanently with a series of tattoos. Anyone raised in a shifter community can instantly recognize the significance of these markings. As the warform initiate progresses through the class, the tattoos become more complex and expansive. The warform initiate gains a +1 bonus to all charisma-based skills and checks made in regards to shifters for every two levels in this class. This bonus also applies to leadership score, but any cohorts or followers that would not be possible without this bonus must be shifters. The warform initiate’s rank can be determined on sight by those familiar with them. Warform: A warform initiate undergoes his first round of magical treatments, gaining power beyond that of a normal shifter when he shifts. A shifter entering warform doubles the usual ability bonus from their shifter trait, but is in all other ways treated as just having shifted as normal. A shifter can enter warform a number of times each day equal to the number of times he could normally shift in a day plus one, and it lasts for a number of rounds equal to (3 + con modifier + # of shifter feats he possesses). In addition, at 3rd level and every odd-numbered class level thereafter, the shifter gains an additional use of warform each day. Warform Abilities: A warform initiate gains special bonuses while in warform, based on his shifter trait. If the warform initiate has more than one shifter trait, he gains warform abilities based on his primary shifter trait. Natural Armor: While in warform, the warform initiate gains the listed bonus to natural armor as his skin grows thick, bony plates and scales. At 6th level, this armor becomes thick and heavy enough that the warform initiate can no longer wear armor while in warform. DR: The warform initiate gains damage reduction as indicated on the table while in warform, his flesh hardening and becoming more resilient. Spell Resistance: At 6th level, a warform initiate gains spell resistance equal to 10+his HD. Heavyweight: At 10th level, the increased bulk the warform initiate gains while in warform allows him to function as one size category larger in many ways. As long as the warform initiate is in warform, whenever the warform initiate is subject to a size modifier or special size modifier for an opposed check (such as during grapple checks, bull rush attempts, and trip attempts), the warform initiate is treated as one size larger if doing so is advantageous to him. A warform initiate is also considered to be one size larger when determining whether a creature’s special attacks based on size (such as improved grab or swallow whole) can affect him. However, his space and reach remain those of a creature of his actual size. The benefits of this ability stack with the effects of powers, abilities, and spells that change the subject’s size category. Hide: The warform Initiate gains the listed bonus to hide checks while in warform, as their skin becomes darker and more sleek. Climb Speed: At 2nd, 6th, and 10th level, the warform initiate’s climb speed increases by 10 feet. Sneak Attack: If a warform initiate in warform can catch an opponent when he is unable to defend himself effectively from his attack, he can strike a vital spot for extra damage. The warform initiate’s attack deals extra damage any time his target would be denied a Dexterity bonus to AC (whether the target actually has a Dexterity bonus or not), or when the warform initiate flanks his target. This extra damage is 1d6 at 2nd level, and it increases by 1d6 at every even level thereafter. Should the warform initiate score a critical hit with a sneak attack, this extra damage is not multiplied. Ranged attacks can count as sneak attacks only if the target is within 30 feet. With a sap (blackjack) or an unarmed strike, a warform initiate can make a sneak attack that deals nonlethal damage instead of lethal damage. He cannot use a weapon that deals lethal damage to deal nonlethal damage in a sneak attack, not even with the usual -4 penalty. A warform initiate can sneak attack only living creatures with discernible anatomies—undead, constructs, oozes, plants, and incorporeal creatures lack vital areas to attack. Any creature that is immune to critical hits is not vulnerable to sneak attacks. The warform initiate must be able to perceive the target well enough to pick out a vital spot and must be able to reach such a spot. A rogue cannot sneak attack while striking a creature with concealment or striking the limbs of a creature whose vitals are beyond reach. Acrobatics: At 4th level, the warform initiate gains a +2 bonus to Balance, Climb, Jump, Move Silently, and Tumble. At 8th, level, this bonus increases to +4. Camouflage: At 6th level, the warform initiate can make make hide checks in any natural environment, even if the terrain doesn’t grant cover or concealment. Hide in Plain Sight. While in any sort of natural terrain, a warform initiate of 10th level can use the Hide skill even while being observed. Spot: The warform initiates eyes grow sharper and more perceptive. The warform initiate gains a bonus on spot checks as listed on the table. Sniper’s Eye: With his enhanced vision, the warform initate is better able to pick out weak spots on distant targets. The warform initiate gains the listed bonus as a competence bonus on all ranged attack and damage rolls. Precise Shot: While in warform, the warform initiate is treated as having the precise shot feat. Rapid Activation: A warform initiate can use his dreamsight elite feat as a swift action. Improved Precise Shot: While in warform, the warform initiate is treated as having the improved precise shot feat. Perfect Eye: While your Dreamsight Elite feat is active, you gain the effects of a True Seeing spell. Allsight: While your dreamsight elite feat is active, your vision becomes perfect. This effect works like a true seeing spell, but with no limitation on range. It also penetrates concealment. Ultimate Sniper: at 10th level, a warform initiate in warform does not take penalties to attack rolls for range. The warform initiate cannot fire further than his normal maximum range with this ability. Powerful Charge: At 2nd level, when making a charge attack with his horns, a warform initiate deals an additional 1d6 points of damage. Every even-numbered level thereafter, this damage increases by 1d6. Mighty Horns: At 2nd level and above, a warform initiate adds 2x his strength modifier to gore attacks when he makes no other attacks in the round. If attacking with his gore as a secondary attack, he adds his full strength modifier to damage. In addition, the warform initiate can use his horns to gore an opponent without charging, dealing 1d6 points of damage as a natural attack. Batter: at 6th level and above, the warform initiate deals double damage with his horns when attacking an object or structure. Speedy charge: At 8th level, the warform initiate can move up to four times his speed when making a charge attack. Rampage Rush: At 10th level, the warform initiate gains a special option when charging. If you successfully knock down an opponent using the Gorebrute Elite feat, you may run over him and onto another target. If you choose to do so, you deal 2d6+1.5 strength damage to the target and may select a new target to charge. You cannot turn more than 45 degrees in either direction from your original charge when charging a new target. If you knock down another opponent, you may charge again as many times as you wish. However, you may not move more than four times your speed in a single round. Dodge: At 2nd level and above while in warform, the warform initiate’s speed and reflexes sharpen dramatically. The warform initiate gains the listed bonus as a dodge bonus to AC and reflex saves. Speed: At 2nd level and above while in warform, the warform initiate becomes much faster. The warform initiate’s base land speed increases by 10 feet. In addition, at every even-numbered level thereafter, the speed increases by an additional 10 feet. Uncanny Dodge: At 2nd level, a warform initiate in warform retains his Dexterity bonus to AC (if any) even if he is caught flat-footed or struck by an invisible attacker. However, he still loses his Dexterity bonus to AC if immobilized. If a warform initiate already has uncanny dodge from a different class, he automatically gains improved uncanny dodge instead. Evasion: At 4th level and higher, a warform initiate in warform can avoid even magical and unusual attacks with great agility. If he makes a successful Reflex saving throw against an attack that normally deals half damage on a successful save, he instead takes no damage. Evasion can be used only if the warform initiate is wearing light armor or no armor. A helpless warform initiate does not gain the benefit of evasion. Improved Uncanny Dodge: At 6th level and higher, a warform initiate in warform can no longer be flanked. This defense denies a rogue the ability to sneak attack the warform initiate by flanking him, unless the attacker has at least four more rogue levels than the target has warform initiate levels. If a character already has uncanny dodge from a second class, the character automatically gains improved uncanny dodge instead, and the levels from the classes that grant uncanny dodge stack to determine the minimum level a rogue must be to flank the character. Improved Evasion At 8th level and above, a warform initiate in warform gains improved evasion. This ability works like evasion, except that while the warform initiate still takes no damage on a successful Reflex saving throw against attacks, henceforth se takes only half damage on a failed save. A helpless warform initiate does not gain the benefit of improved evasion. Impossible Rush: A warform initiate in warform can move up to five times his base land speed as a full-round action. Enhancement: At 2nd level and above, a warform initiate in warform gains an enhancement bonus to attack and damage rolls made with his bite attack. Terrible Fang: At 2nd level and above, a warform initiate adds 2x his strength modifier to bite attacks when he makes no other attacks in the round. If attacking with his bite as a secondary attack, he adds his full strength modifier to damage. Sabertooth: At 6th level, the warform initiate’s bite attack deals quadruple damage on a critical hit. Crushing Jaws: When you make a successful bite attack, you may make a grapple check as a free action without provoking attacks of opportunity. Enhancement: At 2nd level and above, a warform initiate in warform gains an enhancement bonus to attack and damage rolls made with his claw attacks. Rend: At 2nd level, if the warform initiate hit’s a target with both claw attacks, he automatically deals 1d4+ strength mod extra damage. Rake: At 6th level, the warform initiate gains two rake attacks. These rake attacks are identical to his claw attacks, including the enhancement bonus granted by this class, but they may only be used on a full attack. To use them properly, the warform initiate must make a DC 10 jump check as a free action before beginning his full attack. If he does not make the jump check, he cannot use his rake attacks. A warform initiate may count his rakes as claw attacks to rend, but cannot deal rend damage more than once per round. Bloody Claws: At 8th level, a warform initiate in warform can tear at small cuts until they become horrid, bleeding wounds that continue to harm the target. If a living creature takes damage from his rend, the target takes one damage on the following round for each claw that hit. He takes this damage each round until he receives at least one point of healing. Multiple wounds stack. Leaping Pounce: At 10th level, when the warform initiate makes a charge attack, he may make a full attack at the end of his charge. In addition, the warform initiate is trained to leap into the air and coem down onto his opponent, knocking him off balance. As such, before making his full attack, the warform initiate may make a trip attempt against the target as a fee action. Talons: At 2nd level and above, a warform initiate in warform gains a talon attack that deals 1d6+1.5 str damage as the warform initate’s feet sprout claws. These claws do not in any way affect the warform initiate’s movement. These talons deal double damage on a dive attack. Flyby Attack: At 2nd level and above, a warform initiate in warform is considered to have the flyby attack feat. Speedy wings: At 4th level, a warform initiate in warform’s fly speed increases to 60 feet with good maneuverability. Improved flyby: At 6th level and above, a warform initiate in warform is considered to have the Improved Flyby Attack feat. Lightning Wings: At 8th level, a warform initiate in warform’s fly speed increases to 120 feet with good maneuverability. Death From Above: At 10th level, a warform initiate in warform can make a special attack with his talons. As a full-round action, the warform initiate may move up to his fly speed and make a single talon attack against each opponent he threatens while moving. This movement provokes attacks of opportunity as normal. Water Mastery: At 2nd level and above, a warform initiate in warform gains a +1 competence bonus to attack and damage rolls as long as both he and his target are underwater. Blindsense: At 2nd level, a warform initiate in warform gains blindsense out to 20 feet. This blindsense can only perceive objects or creatures below the surface of the water, and it does not function if the warform initiate is not underwater himself. Ravage: At 2nd level, a warform initiate in warform gains a bite attack that deals 1d6+1.5 str points of damage. Swim Speed: At 4th level, a warform initiate in warform' swim speed increases by 20 feet, to a base speed of 60. At 8th level, this speed increases again by another 20 feet, to a total speed of 80. Water Breathing: At 6th level, a warform initiate gains the ability to breathe underwater as he would in air. He also gains this ability while shifted. Piranha Dart: At 10th level, whenever a warform initiate in warform deals damage to an opponent in melee while underwater, he may take a 5-foot step as a free action, darting this way and that with his movements. Lifestrike: When a warform initiate in warform attacks a living creature, his incredibly sharpened sense put him in tune with creatures vitals. Against living creatures, the warform initiate gains a +1 competence bonus to attack and damage rolls. He does not gain the bonus against creatures immune to critical hits. At 4th and every even-numbered level thereafter, the bonus to attack and damage rolls increases by one. The target must be within range of the warform initiate's blindsense to be affected. If the target is within the range of warform initiate's blindsight, the bonus is doubled. Blindsense: At 2nd level, the blindsense granted by the warform initiate’s wildhunt elite feat increases it’s range by 10 feet to a range of 40 feet. At 6th and 10th level, in increases by another 10 feet, to 50 and 60 feet, respectively. Track: At 2nd level, a warform initiate in warform is treated as having the track feat. Blindsight: At 4th level, the warform initiate in warform gains blindsight out to 15 feet. At 8th level, the range of his blindsight increases to 30 feet. Swift Tracker: At 4th level, a warform initiate in warform can move at full speed while tracking. Heartseeker: At 8th level, a warform initiate in warform adds his wisdom modifier to all rolls to confirm critical hits. Deathblow: At 10th level, as a full-round action, the warform initiate may make a single attack against an opponent within range of his blindsight. If the attack hits, the target must make a fortitude save (DC 20+wis mod) or die. Eternal Readiness: At 5th level, a warform initiate may shift at will. He does not gain any of the special benefits granted by warform while shifting like this. He may suppress or resume his shifting as a swift action. Awaken the Beast: The raw power of a warform initiate can inspire others of his race. 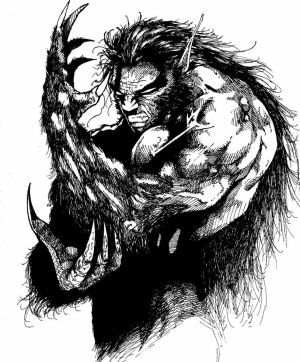 Whenever a warform initiate of 10th level enters warform, all shifters within 30 feet may immediately shift, as though they had activated the ability themselves. However, this shifting does not count against their daily uses of shifting. While shifted like this, they gain a +1 morale bonus to attack rolls, damage rolls, saves, skill checks, and ability checks. They do not have to remain within 30 feet of the warform initiate to benefit from this. You are the elite. Chosen for a combination of innate talent and great skill, you serve the shifter people as the best of the best, your exact role depending on your shifter trait. Beasthide: You are the iron bulwark of your people. You stand firm against all opposition, but when it comes time to bring the fight to the enemy, you become an unstoppable juggernaut of destruction. Cliffwallk: You are the silent killer, the shadow in the dark and the knife that silences the enemies of the shifter people. You are unseen, unheard, and deadly. Dreamsight: You are the heavy artillery, delivering precise shots exactly where they can do the most damage. Gorebrute: You are a living battering ram, a rampaging war machine that destroys anything that stands in your way. You strike fast and hard, crushing barricades and enemies alike. Longstride: You are speed incarnate a living lightning bolt, the ultimate scout. Your task is to be in and out in an instant. You can outrun the fastest mounts, and deal terrible blows to unprepared enemies. Longtooth: You are a mighty warrior for your people. You wade into your foes, striking with weapons and fangs, crushing your enemies. Razorclaw: You are the shock trooper of the shifter army, striking hard, disrupting enemy formations, and attacking in a terrible frenzy of claws. Swiftwing: You are the air support of your people. With scything talons, you scream into the fray, delivering agonizing talon-strikes than disappearing back into the clouds. You incredible speed also allows you to function as a airborne scout. Truedive: You are the defender of the shores, a master of aquatic combat. Your ability to maneuver and strike underwater is unmatched. Nothing escapes your notice in your watery realm. Wildhunt: You are the tracker of the shifter army, able to find and take out your target in any terrain. You are ruthlessly efficient, dealing blows aimed precisely for the vital gaps in an enemy’s defenses. Combat: Your role in battle depends largely on your shifter trait. Beasthide: Your incredible armor, resilience, and massive weight make you perfect in a juggernaut role, shrugging off powerful blows as you do your destructive work. Your heavyweight ability makes you a force to be reckoned with in terms of bull rushes, grapples, and trips. The thick natural armor eliminates your need for armor, but you can still purchase bracers of armor, shields, or amulets of natural armor to further improve your defenses. A beasthide with this class serves well if used with a defensive class, but it can also add much-needed survivability to more fragile characters. Cliffwalk: Your climb speed and great acrobatic skills makes you perfect to fill the role of the skill monkey, and your hide bonus, camouflage, and hide in plain sight abilities also make you exceptional at stealth. Your sneak attack should be your focus in combat, using it to deal heavy blows to unprepared targets, taking them out from hiding. Dreamsight: In battle, you are the ranged support. Your unsurpassed accuracy allows you to deal incredible damage on even the most heavily-armored opponents, eventually circumventing cover, and concealment. Eventually, your incredible sight makes it possible to pick off enemy commanders even from the other side of the battlefield. Your eyes improve as well, making it utterly impossible to hide from the rain of arrows. Gorebrute: Your role in combat is a charger. You can deal incredible damage when you charge, and your rampage rush ability allows you to charge multiple enemies in a round. Batter allows you to destroy fortifications, doors, and walls with ease. Your speedy charge ability lets you charge suddenly from great distances. Longstride: Your incredible speed is your primary advantage. While you may not have much on the way of offense, you can be in and out of enemy territory in moments. Dodge bonuses, uncanny dodge, and evasion are all ways of avoiding traps and ducking attacks, providing a relatively solid defense. Longtooth: Your powerful fangs can be used in conjunction with weapon attacks, or as a weapon in their own right. Crushing Bite allows you to grapple opponents hit with your bite, and sabertooth makes the attacks of your bite terribly dangerous with a lucky roll of the dice. Razorclaw: You role in battle is as a shock trooper. Your claws are deadly weapons, and together with your rakes, you can deliver a flurry of vicious blows. You can leap into the fray to knock down your foes and attack with animalistic fury. Dealing rend damage and bleeding the foe dry rewards you for focusing on one opponent. Swiftwing: Your role in battle is air support. You fly in low, diving into combat to deal double damage with your talons as well as delivering your skirmish damage. Then, before the round is over, you can fly back up and out of reach. Using death from above allows you to deal skirmish damage to as many foes as you can move over in a round, but it leaves you vulnerable. Truedive: Your place in a battle is beneath the waves. Fending off aquatic assaults from the waters of Arcas, or protecting trading vessels from wandering monsters, you are a master of underwater combat. You strike with weapons and fangs, letting your truedive elite feat eliminate the penalties of your chosen weapons, and water mastery make you strike harder and more accurately than ever. At higher levels, your piranha dart ability and increased speed gives you unparalleled agility in the water, and your blind sense makes it impossible for you to be surprised. Wildhunt: Your role in combat is adaptable. Your blindsight and blindsense allows you to fight in total darkness and ignore concealment. Your lifestrike and heatseeker abilities allow you to deal massive damage to living creatures, and your deathblow ability allows you to take out enemies one after another as an efficient death machine. Advancement: A warform intitate’s class level is synonymous with his rank in the organization. The Initiate’s Mark ability makes it easy to see who is the more senior of two warform initiates. Beyond that, the rank is dependant on the strength of the initiate himself. Sparring matches are common among warform initiates when they meet. Resources: A waform initiate can generally rely on the shifter nation backing him up. Warform initiates are often leaders, bringing a small army of shifter followers behind them. Warform initiates are forbidden from forming alliances that may harm the shifter nation, and a renegade warform initiate is hunted down and put to death. “It wasn‘t our fault, elder! We couldn‘t have expected that beast-blood to turn into an abomination!” -So-kar, leader of the failed elven assault on the shifter capital. Warform initiates are grizzled veterans, soldiers of extreme renown. To shifters, they are heroes. To the elves they fight, they are abominations, monsters tainted by the magic of the shapers, and a glimpse into the unholy depths of the shifter’s unclean nature. To others, the warform initiates are a force to be reckoned with, an unpredictable beast, a wild animal. Best to keep a good distance and keep an eye on them. Warform initiates are soldiers first and foremost, and they go where the shifter elders tell them too. More often than not, the arrival of a warform initiate means the shifters are coming not far behind, with an army. Daily Life: Warform initiates are part of the military. They follow the orders of their commanders with unbreakable loyalty. Their great individual power often puts them as the leaders of small teams or as individual agents performing special missions. When not out on a mission, they spend their time in the warform bunker, training themselves or other, lower-ranked warform initiates. Notables: Lo’gann was born in a small shifter city in the north, in the evergreen forests that border the frost-peaked northern mountains. When out hunting one day, his city was razed by an elven assault team. For days, he was on the run, struggling to evade elven patrols as he made his way south to the shifter capital. Once there, he told the leaders what had happened and immediately joined the shifter military. Driven and dedicated, he quickly showed the kind of skill required for the warform initiates. Among the first recruits to be brought into the program, Lo’gann remains among the most famous warform initiates for his incredible prowess. Organizations: All warform initiates are members of W.E.A.P.O.N., the Wartime Evolution and Advanced Practical Operations Network. WEAPON is the organization the creates, trains, and manages warform initiates. Technically, WEAPON is it’s own military branch, but it’s common for it to cooperate closely with other branches, often placing it’s warform initiates under the command of other units. Overall, WEAPON allows it’s warform initiates to work on their own agendas, as long their goals are in line with the increased security of the shifter nation. Heh, you have "Class Name in the World" there. Also, several of the special abilities say that you do extra damage "if you make no other attacks in the round" — how does that work, exactly? What happens if someone provokes an AoO after your turn's over (but in the same round), are you not allowed to take it? That's supposed to indicate using the attack as a standard action, as opposed to using it as part of a full attack. So, a bite at the end of a non-pouncing charge would do the extra damage. So, no, it would not prevent you from taking AoOs. Perhaps I should alter the wording to 'no other attacks during your turn'? Turn would be better, though it's sort of an odd wording — only the Landshark Boots (Magic of Incarnum) use a similar wording to my knowledge, and I've never been quite satisfied with it. I think making it a Standard Action and some mention of "it can replace your attack at the end of a charge; even if you have the Pounce special quality, this option replaces all of your attacks at the end of a charge". Although I suppose the current wording has the advantage (?) of being usable in conjunction with a martial maneuver.